Publishers Weekly just came out with their review of The Human Alchemy, and they seem to think you ought to buy it and read it. Griffin (The Lure of Devouring Light) creates characters who have experienced deeply personal losses that make their quests to rise above circumstances seem a poignant effort to deny that “everything and everyone… might vanish before its time.” His stories are fantastical and horrific, and their outcomes are refreshingly unpredictable. A nice, generous review, which features a couple of brief quotes from the text, and calls out “The Tidal Pull of Salt and Sand” and “Endure Within a Dying Frame” in particular. The Human Alchemy won’t be released until June 30, but the first two advance reviews have just appeared. Griffin’s prose shines, even when it’s written in a tersely poetic present-tense, giving his writing a metallic coolness that juxtaposes well with his warm-blooded characters. Griffin is a confident and imaginative writer with a unique voice. Fans of horror, or just fiction in general, would be well advised to give The Human Alchemy a try. My thanks to both reviewers, and both review venues, for devoting their resources and attention to my work! Tomorrow morning I’ll be recording an interview with Michael David Wilson and Bob Pastorella for their This Is Horror podcast. I’ve been a fan of their podcast for quite a while and have listened to most of the 200-plus episodes. If you’re a contributor to the This is Horror Patreon account, you can submit questions for me, if you do it today. One of my favorite parts of these interviews, as a listener, is the audience-submitted questions, so I hope there will be at least a few for my interview. A direct link to their post asking for questions is HERE. I look forward to chatting with Michael and Bob, and will be sure to let everyone know once the interview is available to their Patreon subscribers, and again a bit later when it’s available to non-subscribers. This time, I was lucky enough to get responses from Richard Gavin, Brian Evenson, Gabino Iglesias and Gemma Files. Despite my “no repeat” rule, S.P. Miskowski did return to write the introduction, about which I’ll say more in a future blog post. For now, here’s what Richard, Brian, Gabino and Gemma had to say. I can’t possibly thank these four amazing writers enough to accurately convey how flattered and pleased I am to receive their words. I hope anyone not already familiar with the work of any or all of the four will seek it out. An upcoming book doesn’t seem quite real until certain things happen. When I see the cover art, when I get the marked-up manuscript from the copy editor, when reviewers start mentioning they’ve received their Advance Review Copies, when the book is available for pre-order, and when the cover art is first revealed to the public, these are the things that make me feel like the book is something that’s really going to happen soon. My second collection The Human Alchemy will be released next month, and we’re now at the stage of passing many of these milestones. I just received the copy edited proofs, and will go through them this weekend. I’ve seen what cover will look like, and it’s fantastic. The Advance Review Copies have gone out – here’s a photo from Gordon B. White showing the ARC he just received. This isn’t the official cover art, of course, just a placeholder. We’ve even received some hints of early reviews that will be appearing. Next week, the book will be up for pre-order at wordhorde.com and we’ll be revealing the cover as well. This book is starting to get real! My debut collection The Lure of Devouring Light came out April 30, 2016. Every publication is an accomplishment for a writer, but the first full-length book with your name alone on the cover, not a limited chapbook or an anthology shared with other writers but a full-length publication of one’s own, is a major landmark. Now, two years on, I thought I might reflect on the steps and experiences involved in planning, creating and releasing that book into the world. I received a lot of early support from Joe Pulver, an amazing writer who may be better known as an editor of anthologies, including The Grimscribe’s Puppets, for which he won the Shirley Jackson Award. Joe was the first to tell me to start planning for my first collection at least two years before I had any hope of having the book come out, and preferably three years. He urged me to think about the ways my stories fit together, even stories written years apart, some of them for different themed anthologies. This helped me to think about the focus of my work, and the ways different stories often worked together. Another important consideration was to figure out which stories wouldn’t fit well in a book next to the others, and plan to exclude those. Even before I had completed all the stories that would go in the book, Joe Pulver was suggesting a couple of possible publishers for my future collection, one of which reached out to me to discuss the possibility. By the time I actually had all the stories finished, a new publisher (other than those Pulver had told me I should consider) had started putting out interesting, great-looking books that were immediately well received. I made a mental note of this new press, Word Horde, and ended up getting to know Editor & Publisher Ross Lockhart as we attended some of the same conventions. I submitted stories to Word Horde anthologies like Cthulhu Fhtagn! and The Children of Old Leech, and my stories made it into those books, by which time I decided Word Horde would be my first choice to publish the collection, if Ross could be persuaded to take on a first collection by a fairly new writer. By the time my complete manuscript was ready to submit, Ross agreed to take a look. Most writers entertain fantasies of their submitted work being accepted immediately, with promises to publish it as soon as possible. Real life doesn’t usually work like this. Ross let me know he’d taken a look at the manuscript and he liked what he’d seen, but while he wasn’t rejecting it, he also wasn’t immediately prepared to accept it, either. I waited a length of time which, while objectively reasonable and understandable, also led to impatience or anxiety on my part. Others to whom I confided the situation, after months had passed, said I owed it to myself to submit the book elsewhere. I decided to let Ross reach a decision on his own time, believing the fit to be a good one, and feeling (as I still feel) that Ross was absolutely fair and honest, so if he were to determine he wasn’t interested in the book, he’d let me know. While I waited, I continued writing, publishing new stories, attending conventions and doing all the other writer stuff. That’s an important point — while you’re waiting, don’t just stop! Keep working on other projects no matter what. Writers, editors and publishers love to gossip at conventions. Everyone likes to hear the early news of which books are coming out when, and from which publishers, which writers and presses are on the rise, which press isn’t paying their royalties or sending statements, who’s making promises and not following through, and so on. One of the really fun things about convention-going is the chance to hear which book deals are in the works well in advance of the book being officially announced. I was asked many times about the status of my collection, and where I expected to see it published. People suggested other places that might be interested, while others said it made sense to be patient and hold out for my preferred publisher. Some expressed surprise that I’d submitted to one of the better-regarded indie presses in the weird/horror corner, the implication being that I ought to have more realistic expectations. One writer at a ReaderCon dinner rolled his eyes and suggested a writer in my position needed to start out by aiming a bit lower. While I hadn’t reached a point of losing interest in having my book come out from Word Horde, as another big convention approached, I queried Ross and said that if he was leaning toward a “no” on the book, I’d like to know so I could talk with other publishers at the con. This wasn’t meant to be an ultimatum, and didn’t seem to be taken as one, but did have the effect of eliciting the most solid response I’d received. Ross told me he was near to resolving another long-pending deal (which I now guess to have been for John Langan’s excellent novel The Fisherman), and promised a definite answer within two weeks. Very soon my patience was rewarded, and Ross wrote to say he’d love to put the book out on Word Horde in 2016! My collection ended up in the best possible hands. Incidentally, I don’t tell the story of my wait for a definite answer to suggest that Ross took too long. My point is that publishing often involves patience, and very often the best possible result is neither the easiest or quickest option. Writers who persevere are far more likely to end up reaching their goals, whatever those may be. It’s far better to be published well than to take the first, easiest path available, and hurry the work into print with sloppy or careless publishers, or those who say yes to projects they never manage to release. Too many publishers over-promise and under-deliver. You’re always much better off dealing with a partner who delays making any promises until they’re sure they can commit. If you’re dealing with a big New York mega-publisher, it’s possible they make all the decisions and choices involved in turning your batch of stories into a book. They may purchase cover art, hand it off to their in-house cover designers, send out an advance manuscript hoping to get blurbs from a handful of famous writers, and so on. One of the pleasures of dealing with a smaller press is the opportunity to have input on these important aspects of the book. I had already asked John Langan to write an introduction, and he’d agreed. Laird Barron had heard the book was coming, and offered to read it and give me a blurb before I could get around to asking him. I asked a few of my other favorite writers for blurbs, and all agreed. I’ve heard many writers say they hate asking for blurbs, but at least for my first book, the process was a breeze. Ross asked me for suggestions for the cover, and I sent him a ranked list of three artists whose work I had seen around the internet. The second and third had done covers for many horror and fantasy books, but my first choice was Jarek Kubicki, a Polish artist and graphic designer whose images had a dark, almost Gothic elegance that I felt corresponded to the feel of the book. I didn’t know if he would be interested in making his work available for a book cover, but Ross made it happen. The publication deadline ended up being moved up from late 2016 when another planned Word Horde book had to be delayed, opening up an April slot. John’s introduction came in just before the deadline, we got the proofreading and edits done, and Scott R. Jones did a great job on the cover layout using Kubicki’s art. It’s an incredible thing when a batch of my stories, along with the work and input of others, combine to become a finished book that people can buy and read. The initial release was quite exciting. I received a very nice advance review from Publishers Weekly. On the day of publication, when Ross and I were at the H.P. Lovecraft Film Festival in San Pedro, California (in part to celebrate the release of the book), Laird Barron made a blog post mentioning the book and urging people to check it out. As people who had pre-ordered the book began receiving it, many of them photographed their copies, often in interesting settings. It was wonderful to see instances of the book in the real world, often in the actual hands of people who would soon be reading it. Here’s one with Word Horde Assistant Editor, Elinor Phantom. Two years on, I remain very proud of the book, and especially pleased to see people continuing to pick it up, read it and discuss it. Many books disappear without a trace, while others receive a lot of attention at first and quickly fade. My sense is that The Lure of Devouring Light has been very well received, has sold quite well, and continues to receive very positive attention even now. I’d like to thank Joe Pulver for his advice and guidance, John Langan for his wonderful intro, Laird Barron, Jeffrey Thomas, S.P. Miskowski and Michael Cisco for their blurbs, Jarek Kubicki for the cover art and Scott R. Jones for the design. Of course, Ross E. Lockhart deserves special thanks for taking a chance on my book. Thanks also to everyone who has read, recommended and reviewed my book. 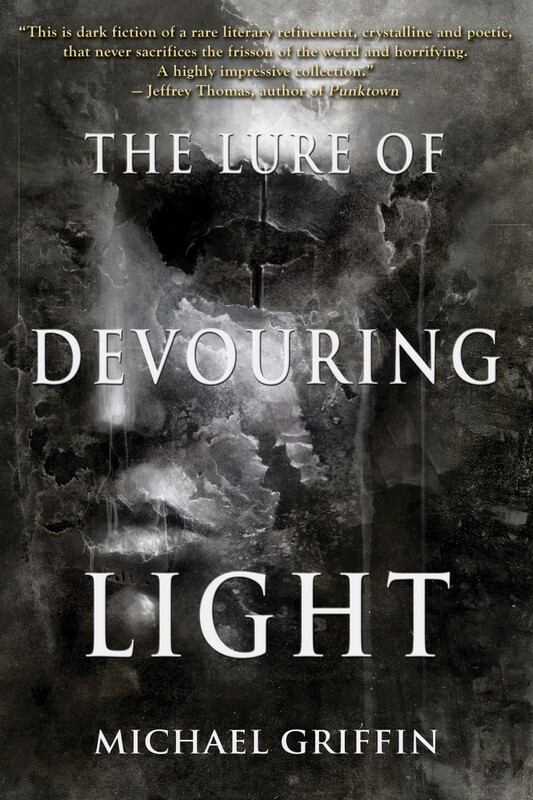 It’s been a great first two years for The Lure of Devouring Light. I can only hope the second collection, coming soon, lives up to the fine example of the first. Check out this nice, lengthy review of Hieroglyphs of Blood and Bone, which gets into the weird, disorienting atmosphere of the book. There’s a print review on his blog and a video review as well, with some overlap between the two. Philip Gelatt, director of They Remain (a film version of Laird Barron’s story “–30–“) is interviewed at diaboliquemagazine.com by Joseph E. Dwyer. They Remain is a wonderful work of atmospheric horror and accumulating dread, which I think everyone reading this blog will enjoy. I’ll be picking up a Blu-ray copy of They Remain as soon as it’s available. I was lucky enough to see a preview of the film at H.P. Lovecraft Film Festival in Portland last October, and thought it was amazingly creepy and atmospheric.